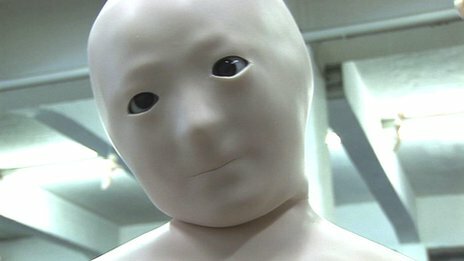 With eery, childlike eyes staring out of a blank plastic face, the Telenoid R1 does not look like a serious tool for business. Its movements are jerky. Limbs are conspicuously absent. And in terms of function, it is essentially just a $3000 video conferencing system, doing what Skype does for free. But Professor Hiroshi Ishiguro of Osaka University believes his invention meets a real business demand, for hyper-realistic, face-to-face communication over long distances. Ishiguro’s system uses a motion-tracking webcam to transmit your voice, facial expressions and head movements to the Telenoid, via a high-bandwidth web connection. The avatar produces only a rough approximation of real body language, but it is surprisingly easy to dupe oneself into regarding it as ‘human’. “Eye contact and head movements are important for everybody. But we also gave the robot a minimal design, so that people can use their imagination to make it more personal”, Ishiguro says. Ishiguro believes that this mind-trickery could ultimately provide a return on investment, by allowing workers – interpreters, salespeople, teachers – to be in two places at once. He is even developing a miniature version of the telenoid, the ‘elfoid’, which he hopes will one day rival ordinary mobile phones. Holding and touching a business colleague’s avatar might be a step too far. But the real threat to the telenoid comes from a rival innovation that is already far more established. Technology companies are making a fortune selling so-called ‘telepresence suites’, which exploit human psychology in a similar way to the telenoid. Telepresence creates the illusion that separate video conferencing booths, located anywhere on the globe, are actually part of the same room. Conference attendees are portrayed life-sized on high-definition screens, while room lighting and furnishings are carefully matched to enhance the effect. Audio is high fidelity too, and the end result is a world away from the stuttery boardroom technology of old. “Yes, it was used for boring boardroom conversations at one point in time. But for us, it is a way to reach out to students all over the globe”, says music teacher Christianne Orto. 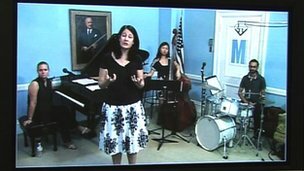 Orto works for the Manhattan School of Music, which uses Polycom telepresence suites in its concert hall and remote learning studios to give lessons to 1,700 international students each year. Polycom has installed over a million telepresence suites, and its CEO Andy Miller forsees a drastic – and potentially worrying – expansion in their range of uses. “We’re at a tipping point now, because culturally people are accepting telepresence as a means of communication”, he says. It is easy to see how this technology could save banks money, not least by removing the very concept of a ‘branch manager’. But it is harder to see how consumers will benefit. Miller, though, does not believe this will be a sticking point. Less liberating is the price tag. 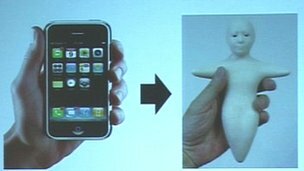 In fact, telepresence makes Ishiguro’s android look rather cheap. A telepresence suite can cost upwards of $300,000 to install, or $300 per hour to rent. That is a big outlay during the downturn – even if businesses can reduce travel expenses over time. To convince more people to buy into the technology, Cisco Systems is trying to lower entry costs. Its WebEx application allows telepresence suites to connect with computers and smartphones, so not all participants have to be in a suite. “With one button you can bring someone up on the screen who is working from home or on their mobile at the airport”, says Cisco’s James Campanini. In a further effort to persuade customers, Campanini commissioned independent scientists to compare video chat against old-fashioned telephone conferencing and instant messaging. 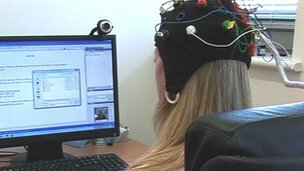 The scientists used EEG electrode caps and other sensors to monitor things like stress and attentiveness. Luckily for Campanini, video chat won the day. But the study also hints at how much productivity could be lost due to people’s current reliance on text tools like IM, SMS and email. No matter which new technology wins the battle for our eyeballs – telenoid or telepresence or something else – perhaps anything is better than depending on the written word. “Stress levels with IM were really high”, says Duncan Smith of MindLab International, who headed up the study. VIRTUAL REALITY advances could someday allow students to dance as shapes and molecules. I first became aware of somatic cognition while learning to improvise music at a piano. After enough practice, a moment comes when you notice that your hands have solved complicated puzzles of voice and harmony faster than your conscious mind can keep up. Fine basketball players, surgeons and pilots report similar moments. In such cases, the human body is extended by physical objects that map body motion into a theater of thought and strategy not usually available to us. Objects like a basketball, a jet or a piano play a role in somatic cognition that is similar to the role of words in conscious thought. The first hint that avatars could become the ultimate somatic objects came to me in the form of a software bug in that Palo Alto garage. I was inhabiting a humanoid avatar, but my hand was gigantic by accident. I bent my fingers and was suddenly engulfed by my fingertip. The surprise was that I could still operate a huge hand effectively. This led to a question: How strange could an avatar get before a person could no longer control it? The answer turns out to be an even bigger surprise. People can inhabit awfully odd avatars. One of the early avatars was a lobster—a creature with more limbs than a human. By mapping values from body poses, it turns out people can learn to inhabit other bodies not just with oddly shaped limbs, or limbs attached in unfamiliar places, but even bodies with different numbers of limbs. This phenomenon is called “homuncular flexibility.” The homunculus is the mapping of the body into the motor cortex, which is a portion of the brain located approximately under the portion of the scalp that would be occupied by a Mohawk hairdo. That the mapping of the homunculus could be so flexible as to adapt to non-human bodies was initially a shock, but a delightful one. The sensation of inhabiting a nonhuman avatar is a new kind of pleasure. Think about what it would be like to wear wonderful clothing, combined with driving a superb vehicle, combined with mastering an extraordinary physical skill. It is like all those things together, but more expressive. When we can successfully inhabit a nonhuman avatar, we are exploring not only the brain’s deep history, but also the potential far future of all the creatures for which it is preadapted—what might happen in hundreds of millions of years. Becoming an avatar is a form of extreme time travel for the brain. One of the principal impediments to becoming an avatar in full has been the physical instrumentation. For many years, you’ve had to put on a special body suit. As has always been the case for virtual reality, I expect the revelation of its true potential to take place gradually. The early years of popular access to avatar tracking will almost certainly not spark radical exploration of somatic cognition. Instead, people will turn into merely human avatars for playing sports, hunting dragons, settling into yoga poses and so on. But then what? My favorite experiment so far involved turning elementary-school kids into the things they were studying. Some were turned into molecules, dancing and squirming to dock with other molecules. In this case the molecule serves the role of the piano, and instead of harmony puzzles, you are learning chemistry. Somatic cognition offers an overwhelming emotional appeal for education, because it leverages vanity. You become the thing you are studying. Your sensory motor loop is modified to incorporate the logic of a science, and you develop body intuition about that logic. No one knows how big a deal avatar-directed cognition will be. Will students routinely dance to learn chemistry in the future? Quite possibly. A student might also become a triangle to learn trigonometry, or a strand of DNA to learn about biology. Will professional nanotechnology engineers become molecular structures in order to refine them? Once again, it seems quite possible. A natural question to ask is whether somatic cognition could do for the Internet what visual computing did for individual devices. For instance, could you map your body into your Facebook preferences, so that you could dance in order to set them (finally making them intuitive)? There are vast problems to solve before we can see how far the somatic frontier of human cognition can go. It will be painfully slow work at times, but it is possible that we are waking up a huge part of ourselves that will expand what it means to think. What could be a lovelier adventure?